Now that lake Eucumbene is dropping thing have slowed up in most places up the top end off the lake but with that the fishing has picked up down around seven gates, Buckenderra, Middling bank, Rushes and frying pan.Things are looking really hot and dry out on the lake at the moment so if your are heading that way take car and take plenty of water. Fishing at the moment has been slow through the day but once the sun starts going down the activity on the water has picked up most fishers have been doing better from 6pm till late. Best flies are black, black, black Nymphs, Minnows, woolly Buggers, Woolly Worms. JINDABYNE FLY LAKE AND RIVER REMEMBER FISH AT THE RIGHT TIME YOU WILL GET GOOD RESULTS !! The fishing is ok at Jindabyne but with this hot and dry weather things will change the fish will go deeper and harder to get so if your are heading up that way fish at the right time you will get good results try around 6pm till late you will find more fish feeding and more active at that time. Over on the Eastern side fishing has been at its best early in the mornings Jindy East and Kalkite have been the pick. Best flies have been Muddlers and Mrs Simpsons late in the evenings larger woolly buggers. Jindabyne seems to be fishing better with the sun behind your back if that helps!! Up on the Thredbo river thing have been a little quiet down the bottom end with better results coming from up around the diggings ski tube and Thredbo town itself. Best flies have been red tags, caddis, Nymphs again best times have been early mornings and late afternoons though the day bead head nymphs are the go. Now the lake is starting to drop the fishing is starting to change the earlier you get out the better the fishing with some really good results most trollers have been getting rainbows. Around 6am slow the trolling speed down start moving out into the deeper waters keep the mono on just slow down this is when you will start getting the browns. Best areas are frying pan, Rushes, Middling Bank, seven gates, Wainui bay, Brookwood Bay. Peter at Braemar with a fishing report from the last week of February. Conditions have been very very tough for all anglers and visitors, the Lake is disappearing big time now, over 12% gone in 7 weeks, just makes you wonder what the hell is going on, anyway, no use whinging about it, we’ve just got to try and cope with whats onoffer right now and frankly that hasn’t been much. The fine sunny weather is starting to be annoying for a lot of anglers, there has been absolutely no change in the weather since February 12th, no rain what so ever and the relentless heat is obviously playing a part with fish being very reluctant to come in close, however some people have done well toying in those conditions so its a matter of perserverance once again to see if reuslts will come your way. 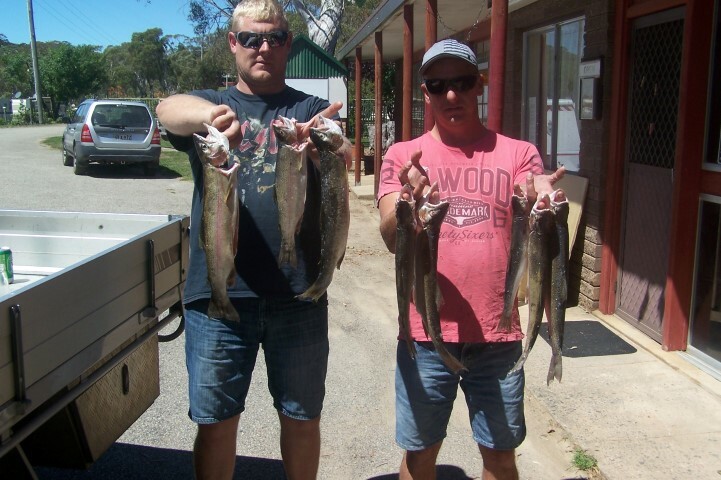 Paul and Trent from Victoria once again led the Victorian brigade with a very impressive catch of Rainbows last Saturday week, all caught on worms which surprised everyone at camp, the fish ranged between 35cm and 45cm and were very healthy indeed, well done guys. Elke Stadler has been having a bit of luck with powerbait which had not been doing well at all, Elke managed 2 nice Rainbows and a Brown at the front of the Park over this past weekend and Stephen Roberts had a red letter afternoon last week managing 3 nice Rainbows up to 48cm trolling mid afternoon. The flyfishing has turned poor once again, even the ever reliable mudeye patterns have failed to make an impression, it really is very tough going right now. Pictured below are Paul and Trent with a sample of the Rainbows that were all caught on worms. Well jindy has Improved over the last few weeks with some really good results coming in . As Eucumbene get up early the fishing is at its best. When you start hooking up start doing a few loops do not just move on go around hit the same spot a few times you will realise that’s the way you troll at jindy with better results. Tassie’s, Blades, Minnows are the best lures. My son Lochie and I hit Jindabyne on Saturday night and tried bait fishing only to have our worms continually taken by yabbies. During the night we saw heaps walking along the shallows keeping Lochie entertained as he chased and counted them before we hit the hay. We were up before it was light packing up in the dark with lines out at first light. We had success between Lion Island and the boat ramp with three Browns and two Rainbows coming in, all but one were on Downrigggers with green frog and yellow wings tassies doing the damage. Later we pushed up to the snowy arm landing a nice 55cm Brown on a green frog tassie before a couple of boats thought the arm was better for wake boarding. I mean the lake is tiny and there aren't many other places they could go. We moved back towards waste point and I continued to work the Downrigggers real close to the bottom when one went off and Lochie landed his best trout to date, another 55cm Fat Brown, again on the green frog tassie. With that fish just hitting the net and with the boat just in gear the other Downriggger went off and I was on to a real good fish. With one already in the net I quickly reached over pulling it out so Lochie could use the net. We got eyes on the next fish and it was another good one. Once in the net and measured the fish went 58cm. This fish fell to a brown frog coloured tassie. When guttered all the big fish had yabbies in their bellies. We left with a total of eight fish, three really good ones.